PHILLY-BORN AND -RAISED comedian Craig Shoemaker is retiring from the stage for good. But for his next trick, he'll bring a little Philly to the West Coast. "I've decided to say goodbye to my stand-up career and move on to more purposeful things," Shoemaker said. Before he says goodbye to the bright lights once and for all, Shoemaker will play two shows (one is sold out) at the Sellersville Theater on Saturday. So what are these purposeful things Shoemaker speaks of? The L.A.-based comic will open three locations of Tony Luke's in Southern California. The new locations will be the first on the West Coast. Philly expats can look out for those in the fall. 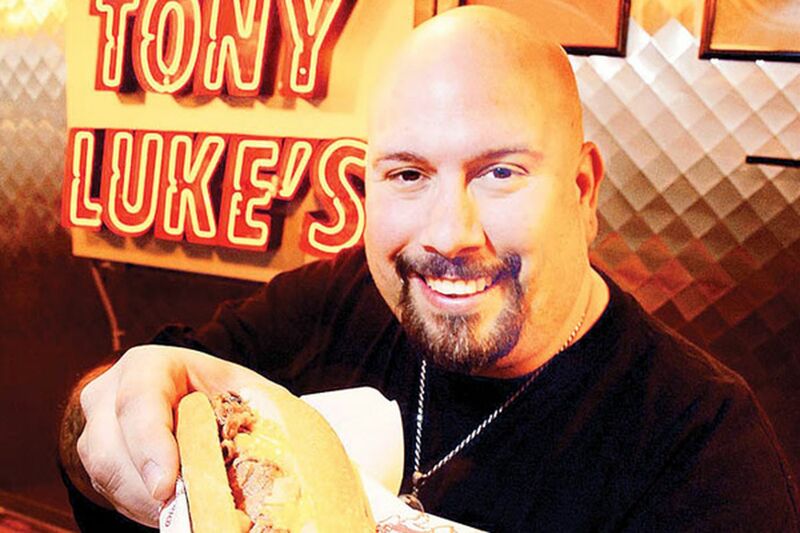 "He has such a passion for Philadelphia and the cheesesteak and he'll bring that passion to L.A.," Tony Luke Jr. told me. "It's more than just a cheesesteak, it's a feeling. He's bringing not only the product but that feel to it, too." Shoemaker echoed that sentiment. "Growing up in Philly has informed everything I do," he said. Case in point: Shoemaker's partner in his cheesesteak endeavor? His accountant, Frank Cassidy, whom he met at Ellwood Elementary while growing up in Northwest Philly. In addition to the cheesesteak business, Shoemaker is partnering with local production company Nancy Glass Productions on five new in-development television projects, including a show with Eagles long snapper Jon Dorenbos, his wife, Julie Dorenbos, and BFF Susie Celek called "Straight Eye for the Whipped Guy." Shoemaker describes it as a makeover show for guys deemed too feminized. The Dorenboses and Celek will be part of the straight-eye team. But that's not all. Also in the works: a book and a documentary about the healing power of laughter, based on the struggle of local movie scribe Michael Goldberg ("Cool Runnings," "Little Giants"). Shoemaker decided to retire for his kids. He told me he was so excited to have a kid after being raised without a father. "I couldn't wait to be called 'dad,' " Shoemaker said. "But the first thing he called me was 'airport,' so I figured I should get off the road." Although Shoemaker is leaving for the right reasons, it's still a kick in the pants. "Strangely, I've never done better on stage than right now," Shoemaker said. But that won't make him change his mind. "It's time," he told me. While on the set at local channel WMCN-TV (Channel 44), "Real Housewives of New Jersey" star Jacqueline Laurita - who confirmed recently to Life & Style that she would not participate in the sixth season of the Bravo reality show - called her past work "petty nonsense . . . like static in my ears" in light of her new work as an autism advocate. Laurita, who also was spotted at Wegmans Cherry Hill (2100 Route 70 West) picking up a sushi assortment and bottle of BLK water, was taping an autism-themed episode of "Power Your Life with Dr. Jo Anne White," slated to air April 2 at 8 p.m. Laurita talks about her 4-year-old son, Nicholas, who was diagnosed with autism. She is shopping a book about autism to publishers. Laurita will appear on the show with Bucks County's Linda Kuepper, CEO of the Autism Cares Foundation, which will be hosting its annual gala fundraiser May 2 at the Bellevue. * CBS3 will hold its fifth annual Ronald McDonald House Charities Phone Bank today from 6 a.m. to 8 p.m. CBS personalities - including CBS3's Chris May, Jessica Dean, Kathy Orr, Beasley Reece, Ukee Washington, Erika von Tiehl and Kate Bilo - will play emcee, along with CBS radio personalities. To donate, call the phone bank at 1-844-977-CBS3, text FAMILY to 20222 for a $10 donation or donate online at CBSPhilly.com. * Jennifer Lynn is now officially the host of WHYY's "Morning Edition." Lynn has been filling in for Jo Ann Allen since January. Allen left her post to pursue her passion: writing screenplays. * While in town doing a meet-and-greet at her South Philly boutique Addiction (1713 S. 12th St.), Alicia DiMichele, of "Mob Wives," got a might peckish and headed over to Geno's Steaks (1219 S. 9th St.) for a quick bite to eat. I heard she prefers her steak wit'.